It’s in the newspaper and on TV. Another link to why bee populations are in decline. Neonicotinoids are being talked about a lot today, but why? What are they? How do they affect bees? Also called neonics, they are a group of pesticides that are chemically similar to nicotine. These pesticides are used in a large variety of ways in agriculture, tree care, and ornamental gardening. Neonics are a type of systemic pesticide, meaning the chemical is absorbed into the plant’s tissues making them harmful to insects that come in contact with treated plants. How are plants treated with these pesticides? These pesticides are applied in a variety of ways. They can be sprayed on the soil and then taken up into the plant tissues. The effects of soil treatments can last for several years; available for later untreated plants to take up as well. Seeds can be treated before planting, which will also result in the chemical being taken up by the plant as it grows. The entire plant can be simply sprayed with the pesticide and then absorbed through the leaves. Trees can be injected with these pesticides. 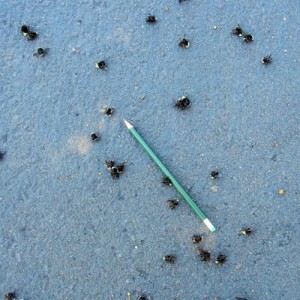 Neonicotinoids in granule form are spread over lawns. Once a plant is treated, depending on the chemical, it can stay active for months to years. Even when following the correct instructions on the label, concentrations of these pesticides for ornamental use are much higher than when used for agricultural purposes. 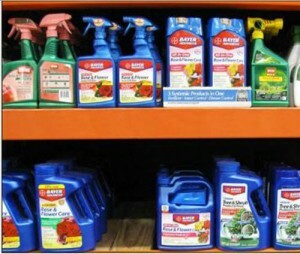 Plants treated with these chemicals are found in many retail stores and garden centers. 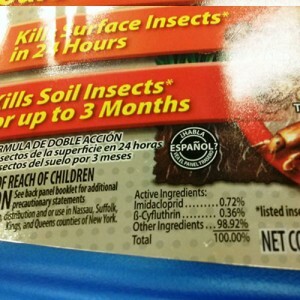 These pesticides are available commercially at many hardware, retail, and garden stores as well. How do neonics affect pollinators? Bees can become exposed to the pesticides through gathering pollen and nectar from treated plants. The pesticide affects their nervous system, paralyzing and disorientating them. This enables them from returning to the safety of their nests. Their inability to effectively forage eventually ends in death. Colonies of bees affected by neonics have also been seen to grow slower and produce less offspring. Some studies have also shown that even bees that were exposed to non-lethal doses of neonics still became more susceptible to diseases and parasites. Many large distributors of plants pre-treat their products with neonics. Ask if your local garden store sells treated plants. Only buy plants and seeds from retailers you trust and can assure you the plants have not been treated with these pesticides. Encourage your local retailers to label plants that have been treated with neonics. Limit the use of pesticides in your garden. Become knowledgeable about the types of “pest” insects in your garden and if they are an actual threat to your plants. Often times insects like aphids might look unsightly but will not kill your plants. If you decide to use a pesticide, consider using natural products or perhaps mechanical approaches that will suite your needs. Neonicotinoids are not the only factor related to pollinator population declines. Bees and other pollinators are also suffering due to habitat loss, parasites, diseases, and even other types of pesticides. Planting native plants that are neonic free is a great way to help pollinators by providing critical habitat and food. 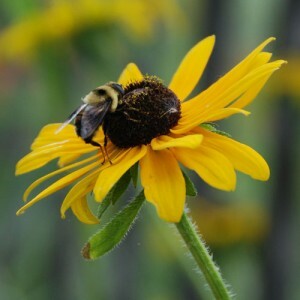 Natural Shore is committed to providing healthy neonic free plants. We are proud to say that we have never treated plants with neonicotinoids. 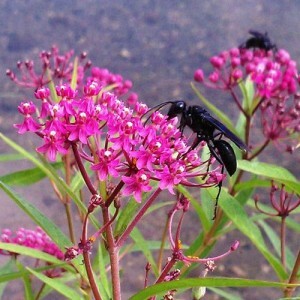 Our plants are pesticide free and ready to welcome any pollinator looking for a great lunch! See our plant list here. Bumble Bee on a Wild Bergamot plant. 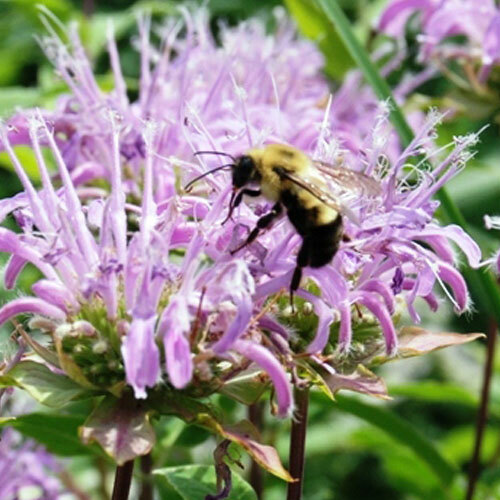 Interested on how native plants and bees interact? Look at Heather Holm’s book Pollinators of Native Plants sold on Amazon and at our retail nursery.